Daisuke Mori, Executive Chef at Takumi by Daisuke Mori, has a unique international culinary background that has inspired his passion for fusing ingredients and traditions from around the globe. 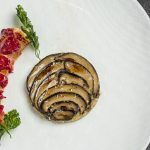 After completing an intensive vocational training course at Osaka’s famed Tsuji Culinary Institute, forged his career in the kitchens in the likes of three Michelin-starred Chateau Restaurant Joel Robuchon in Tokyo; two-starred Restaurant Taillevent in Paris; and one-starred Restaurant Signature at the Mandarin Oriental Tokyo. 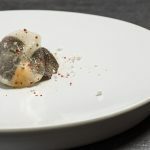 From 2010 to 2014, Mori spent time in Poznan, Poland, where he led fine dining kitchens at Restaurant Jadalnia and five-star boutique hotel Blow Up Hall 50/50. 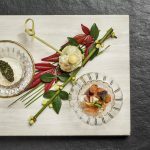 In Hong Kong chef Mori now capitalises on his extensive experience to marry the finest Japanese ingredients with timeless French technique. 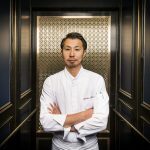 In addition, Mori’s love for fusing French culinary traditions with fresh Japanese seasonal ingredients grew, and led to his impressive stints in world-renowned 2 Michelin-starred Restaurant Taillevent in Paris and 1 Michelin-starred Restaurant Signature at the Mandarin Oriental Tokyo. 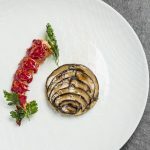 Later, in 2010, Mori took part in a successful promotion of Restaurant Taillevent in Tokyo Kaikan, cooking within a hand-selected representative team under the celebrated Head Chef Alain Soliveres. From 2010 to 2014, Mori spent time in Poznan, Poland to lead fine dining restaurants such as Restaurant Jadalnia and 5-star boutique hotel Blow Up Hall 50/50, and perfected his craft of French-Polish cuisine – which lends subtle hints to his unique signature imprint at Takumi by Daisuke Mori today. 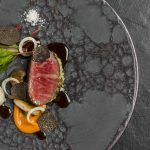 Indeed, awarded 1 star in Michelin Guide Hong Kong and Macau 2017, our mission is to blend the finest French culinary traditions with Japanese ingredients and sensibility to create a unique cuisine that is rarely found elsewhere in Hong Kong. Moreover, seating 12 guests in a relaxing open kitchen environment you and your friends can view the preparation of your dining experience as it unfolds before you. Furthermore, the set menu is inspired by seasonal ingredients which are mainly from Japan, France and Europe.